Digga's 4 in 1 bucket has an extensive range to suit most machines - including skid steers, mini loaders, and tractors. 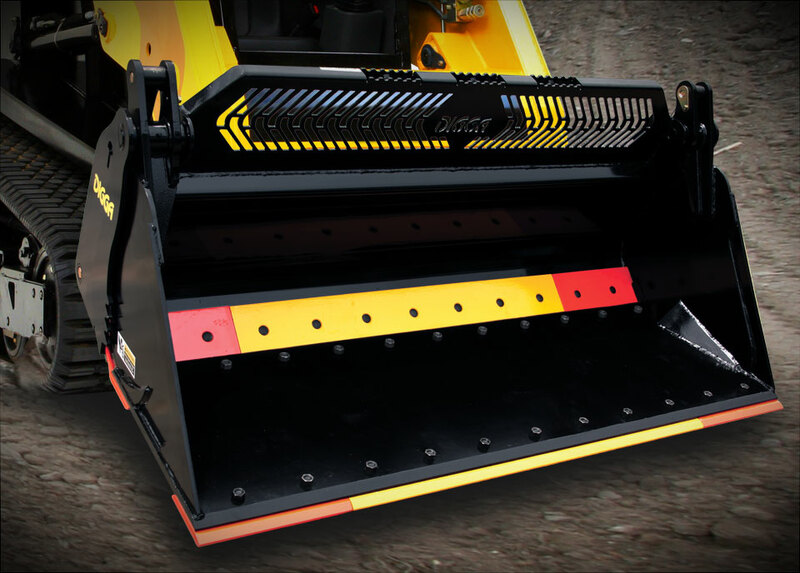 Ideal for grading, scraping, grappling, dozing dirt or material spreading, and most construction work. Digga 4 in 1 buckets come packed with really practical features. Hover your mouse over the features´ 'plus' symbol on the diagram below to reveal the respective benefits. Digga has the right to rectify the issue\grievance before honouring the refund. If an amicable arrangement cannot be achieved within 7 days of the return of the bucket to Digga, this guarantee will take effect. The bucket must have been used for its intended purpose. The bucket must not be damaged beyond normal wear and tear (7 day operation) acceptable. 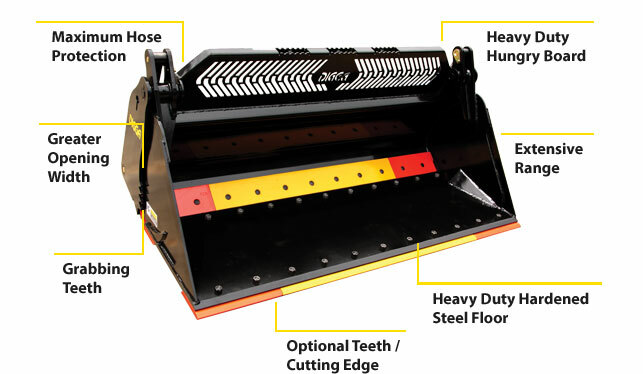 Only valid on a standard 4 in 1 bucket, 20mm flat floor, standard number of teeth and one bolt on cutting edge. Custom buckets built outside of Digga Standard are not covered under this guarantee. Return freight only will only be covered under this guarantee. Only local freight costs within the Brisbane, Sydney, Melbourne metropolitan area will be covered by Digga. Return freight costs outside of these areas must be prepaid by the purchaser. PLEASE NOTE: A 4 in 1 bucket is not designed for extraction or crushing of posts, rocks and other material from the ground. Damage caused due from the performance of this function is not covered under this guarantee.